Christmas has come early for a Harrogate courier company after winning a contract with one of the world’s best-known brands. Dave Kirby Couriers, which is based in Bishop Thornton on the edge of the spa town, will be “following” the Coca-Cola Christmas truck on its eighth annual tour of the UK, which takes in both Sheffield and Leeds. The firm, which launched three years ago with one man and one van, now has a fleet of 17 vehicles, a workforce of 14 and collects and delivers all over the UK and Europe. Over the next five weeks the Dave Kirby Couriers team will deliver all the empty drinks cans from the venues that don’t have their own recycling facilities, to be recycled at a nearby facility. Dave Kirby Couriers managing Director Dave Kirby said: “Over the last few years the Coca-Cola Christmas truck has become one of the best-known features of the festive season. “I’m delighted to say that following our successful tendering for the work last year – and the satisfaction and approval rating from the Coca-Cola events team – we have again been contracted to follow the truck as it criss-crosses the country on its November and December tour. 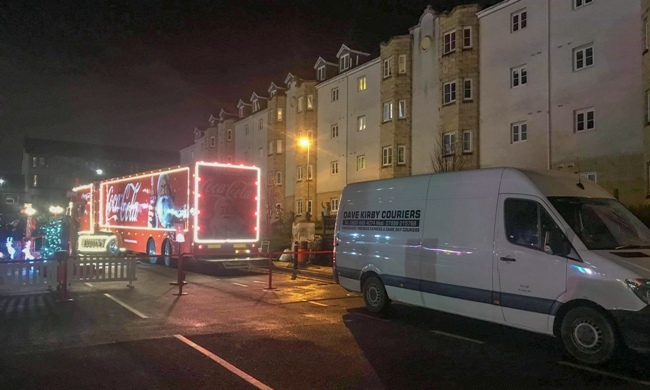 “We started last weekend in Glasgow and will be with the Coca-Cola Christmas truck at the venues that aren’t able to provide recycling facilities for the empty tins and bottles. “Our job is to collect all the used containers, drive them back to Harrogate where they will they recycled by K A Anderson Metal Recyclers, in Ripon.